SEATTLE – More than 150 years ago, American Indian tribes in Western Washington ceded much of the state to the federal government in return for guarantees of salmon and other fishing rights. Now, those tribes say their treaty rights with the U.S. are at risk because the region is losing habitat that salmon need to survive. They say their treaty rights won’t mean much if there are no salmon to harvest, and they’re warning the federal government that they could resort to court action if more isn’t done. “The tribes’ treaty rights, the basis of their economy, culture and way of life are at stake,” said Mike Grayum, executive director of the Northwest Indian Fisheries Commission, an organization of 20 treaty tribes including the Hoh, Upper Skagit, Puyallup, Tulalip, Nooksack and Nisqually. Frustrated by the lack progress in recovering salmon in Puget Sound and along the coast, the Western Washington tribes last summer took their concerns to the White House. In a report, they charged that the federal government has not lived up to its obligations under treaties signed in 1854 and 1855. 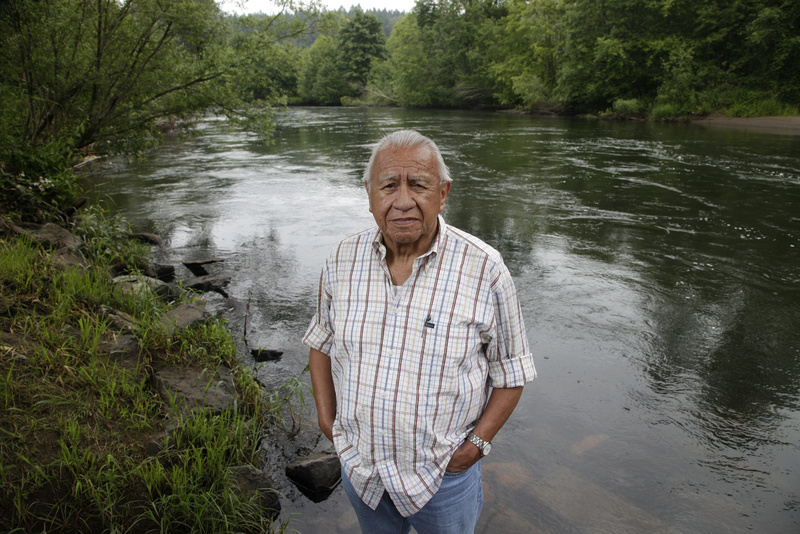 The agreements preserved the tribes’ right to harvest fish and shellfish in traditional grounds outside their reservation, a right reaffirmed in the 1974 Boldt decision and others. Last fall the White House Council on Environmental Quality directed regional leaders of the National Oceanic and Atmospheric Administration, Environmental Protection Agency and the U.S. Department of Agriculture to come up with a plan to address the tribes’ concerns. In May, those agencies agreed to better use their existing regulatory authorities and incentive programs to protect and restore salmon habitat. They also proposed a forum between tribes and federal agencies to resolve local habitat problems with tribes in Puget Sound and along the Washington coast. Bob Turner, assistant regional administrator for the salmon management division of NOAA’s National Marine Fisheries Service, said the agencies take seriously the issues the tribes raised. The tribe is working on how to respond to the federal agencies. Despite millions of dollars spent on salmon recovery efforts in the region, steelhead and salmon such as the Puget Sound chinook continue to struggle. Development, logging, loss of wetlands and floodplains, overfishing, pollution, bulkheads along shorelines, increased human activity and multiple other factors have contributed to their decline. “The fundamental problem is that we’re losing habitat faster than we can restore it,” Grayum said. Grinnel worried that the resources won’t be there for future generations if more isn’t done to protect habitat. The tribes say federal agencies have been overly focused on restricting harvest in recent years while ignoring improvements in habitat. Jeanette Dorner, salmon and ecosystem recovery director for the Puget Sound Partnership, said the tribes’ concerns are very relevant to her agency’s work. “To recover salmon, we have to recover the Puget Sound ecosystem,” she said. “We have to stop destroying critical habitat and we need to restore natural processes and habitat. If we don’t make progress on all of those things together then we can’t recover the salmon,” Dorner said. The tribes blame the lack of political will and coordinated federal leadership, the government’s failure to enforce its laws and the uneven application of salmon conservation measures. “We ceded all this land to the United States for a contract to protect our salmon, our way of life, our culture. We’re gatherers and we’re harvesters. And they forgot about us,” Frank said.